Hello, I am from USA and am not familiar with Thai addresses as they are quite different than US addresses. I sent a package as a gift to the famous boxer Nong Rose. The tracking says its has been delivered however she says she has not received it yet. I am worried I could have been possibly scammed. Could someone please help me verify this address and let me know exactly what it is? A house? A post office? A boxing school? a business? etc. you have some problems with your address. Chaiyaphum and Nakorn Rachasima are both provinces. Did you look at a Thai map? Take a look at this and you will see your problem. The postal code given is for Phimai Nakorn Rachasima. Research may have been necessary. You have no street name on there. here is an interview where the boxer says home is Phimai Nakorn Ratchasima. There is a problem with the address. Neither the district nor sub-district exist at the post code (ZIP code) you have given. Why would you think you've been scammed? Have you sent western union to the tenant of above erm wasteland? so what does not make any sense is that if there are so many errors with the address, how can it be delivered? My tracking information says it has been delivered to the address I provided in my first post. quite amazing looks like a homeless meth lab, thai version. They will go by postcode. 30110 puts you in Korat. The lines of the address will put you in Nong Phai 100km away in where Dilly said. i sent it USPS, the tracking says delivered, but it just says delivered to Thailand. This was after it bounced around in thailand a bit, but it shows the destination is complete. At this point is it a total loss or a chance I can get the package back? If the address is all screwy, you would think it would be undeliverable. You should probably contact USPS and ask them. The tracking says its has been delivered however she says she has not received it yet. Who do you believe? The postal company or the boxer? However, there is a third option - that it has actually been delivered, but not to your friend. Welcome to Thailand and Thai ways. Wonder, where did you get the address from? From the boxer? If so, ask her to send her address to you in Thai script, then post it here for fact checking and perhaps a better transliteration. however she says she has not received it yet. Yeah, you'd better go tell her, nidd. At this point is it a total loss or a chance I can get the package back? If the address is all screwy, you would think it would be undeliverable. i would say it is a total loss. it is probably gathering dust in the back room of a post office somewhere. if mr.postie knows of this famous local boxer, then perhaps it may eventually reach him/her. i got the address from the boxer, mailed it exactly as she gave it to me. When I told her its been delivered and she hasnt gotten it, i provided her with the address she gave me, she then said its the wrong address and that the translating program she used translated it incorrectly, which I suppose is possible given how the address had 2 different provinces in it and not even a street name, I dont see how it could be "delivered". 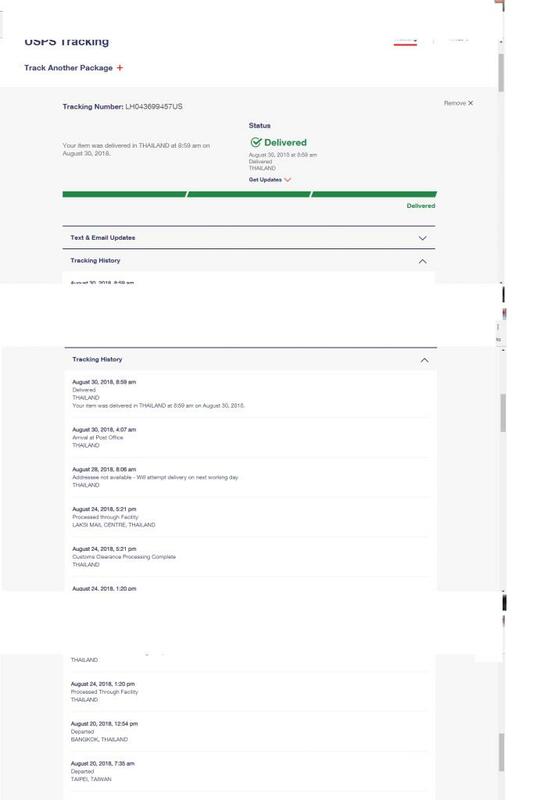 Here is a screen shot of the tracking info I get from USPS, showing it has been delivered to "thailand"
I run a boxing equpiment company, she has agreed to become sponsored by us. I was sending her, her first supplies of equipment. Its possible it was a misunderstanding but I am pretty pissed off as its a big loss of money for me. Also I really dont understand, if the original address was so incorrect, with 2 provinces, no street name, and tracking shows its been delivered to "thailand", its got to either be lost, maybe I could get it back, or a thai worker has has most likely stolen it. Last edited by Wonder; 31-08-2018 at 11:18 PM. Yes, I watched a video earlier today that said Rose lived in Chiwaan sub-district. I really dont understand, if the original address was so incorrect, with 2 provinces, no street name, and tracking shows its been delivered to "thailand", its got to either be lost, maybe I could get it back, or a thai worker has has most likely stolen it. The zip code was correct for Phimai District so the package probably went to the correct district at least. If your package had the name "Nong Rose" on it, perhaps "Thai wisdom" helped the package along its way to the village. Can't be too valuable or customs would have unfurled their talons.